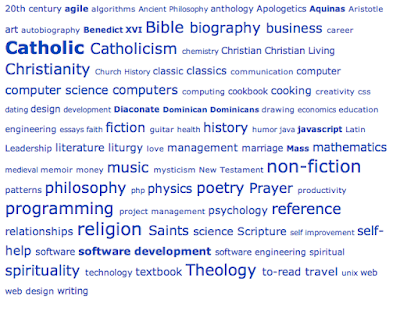 This is cool - if you input all of the books you own into LibraryThing, you can get it to display a tag cloud of your interests. Here are mine. Catholicism, poetry, and programming pretty much sums it up. According to the interview with Donald Knuth in the book Coders at Work, Bill Atkinson's work is "well-documented code with lots of pioneering graphics algorithms in it." Let's review his code together - I created this public code review of his QuickDraw code. Come and leave comments on it and let's learn together. Wow. Just yesterday I opened one of my favorite books, Revolution in the Valley, containing war stories about the creation of the Macintosh computer. I was reading all of the introductory matter carefully (the scans of an engineer's notebook) when I noticed that one of the pages contained signatures of several original members of the Mac team. Note in the accompanying photo the signatures of Woz, Bill Atkinson, Daniel Kottke, Caroline Rose, Andy Hertzfeld, Bud Tribble, and Susan Kare (with the ⌘ symbol). This is really cool. It's funny to think that this is inside a book I bought for $12.99 from a used bookstore in Victoria BC several years ago. Literate Programming is a style of programming invented by Donald Knuth in which, instead of the usual style of embedding comments in code, you instead embed code in comments. The result is a long narrative of prose (describing how you are writing the code) with code snippets interspersed throughout. Under some rare circumstances this bug could even hit data=ordered mode users. for transaction commit to finish. Reminiscent of Literate Programming, no?